The next thing to think about is the grill size that you desire. Grill cooking surfaces are measured in square inches. Knowing what occasions you are most likely to use the grill on will give you a better idea of what size to get. It you are really unsure, it best to get a larger grill than a smaller one. You also will want to look at the type of surface of the grill. There are typically two types of grill surfaces, flat or ribbed. Choosing the surface type is simply based on your preference. Some outdoor grills come with very lavish features. If you plan on using your grill occasionally for barbeque cooking, you may want to go with something simple. If you consider yourself a barbeque cooking enthusiast, there are a ton of bells and whistles that can come with your outdoor grill. Some grills come with motorized hoods, small vegetable grillers inside the main grill, infrared heating, and many more features. You can speak with a specialty retailer to understand the features of a grill before you decide to purchase it. Some grills are easier to clean than others. The ease of cleaning is something you want to take into consideration when choosing the right grill for barbeque cooking. Gas grills are much easier to clean than charcoal grills, which can become quite messy. It is imperative to consider your budget when choosing the right outdoor grill. Grills vary in price. Basic grills cost around $50, while some expensive, high-tech grills can cost as much as $5,000. If your budget is small, it is important to understand that you may not get all the features you desire. However, there are some inexpensive grills that can get the job done. Also, an expensive outdoor grill does not necessarily mean that it is the best one on the market. Again, it is important to look at your budget along with the other mentioned factors when making a decision. Owning an outdoor grill can be a wonderful experience. 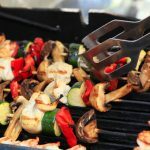 If you take these tips into consideration, your new outdoor grill may very well become the topic of conversation at your next barbeque cookout. Choosing the right grill for barbeque cooking will make your summers more enjoyable than ever.